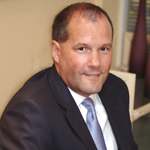 Gordon took over as Director of the Federation of Bakers on in September 2005 following over 25 years’ experience of managing trade associations in a range of sectors from insurance to steel. Since joining the Federation Gordon has been instrumental in focussing on the issues which impact most on plant bakers. This includes consumer health issues, European legislation and public relations. Gordon is an honours graduate, holds an MBA and is a member of the Chartered Institute of Secretaries. He is married with two daughters and lives in North Oxfordshire.